It's probably not a good habit to read a book before going to see its screen adaptation, especially when there is mystery involved. But, after I had been refused entry to a screening of Tinker Tailor Soldier Spy at my local cinema (because why would my 20-year old self think to take her ID to a certificate 15 film?) I decided that the next best thing would be to get the book, as opposed to watching the Alec Guinness boxset that my parents already owned. It was then promptly forgotten in all the other reading that I had to do at the time. But, after a long time waiting, I've finally read it and does it make me keen to watch either of the screen adaptations? 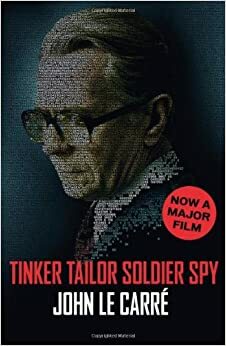 Tinker Tailor Soldier Spy follows George Smiley, a forcibly retired spy who is asked to investigate the potential of there being a mole in the British Secret Service, after the retrieval of a Russian defector goes wrong in ways too convenient to be chance. After taking possession of what few files he can get his hands on, Smiley must narrow down who the mole is out of a pool of four high-clearance members of the service, and in the process get one step closer to the mysterious Soviet spymaster Karla. I had two main reactions to reading this book. First was "How on earth did this manage to get adapted for screen twice?" This is not a reflection on the book's quality: I, in general, rather liked this. It's just that it didn't really feel like it would translate well to a visual medium, simply because quite a bit of the book is people sitting at desks whilst reading files or conducting interviews, and a lot of the information that is needed to piece the mystery together is told through those files and interviews as flashbacks. I'm honestly kind of struggling to see how Smiley cooping himself in a hotel room to read secret files over the space of a week can be adapted to screen. My second reaction was "Why don't I like this more?" Because on the surface of things, Tinker Tailor Soldier Spy is filled with things that I really like, but I don't find myself bouncing around the walls with the excitement of finding a new and interesting thing. So there's a mystery to solve, and the reader is given just as much of an opportunity to guess the mole as Smiley has, since we're privy to the same information: an absolute joy, considering the amount of crime and mystery stories that don't provide this simple courtesy. Perhaps it was this that let me down, because my experience of serious spy novels was largely James Bond-related before picking Tinker Tailor Soldier Spy up, so I was going from a crime reader's point of view. The thing with this novel is that Smiley doesn't get a huge deal of information come his way. At every step, he has to contend with the problem that nobody really wants to talk to him, or give him the whole truth when they do want him there. So it becomes a question of how you think a spy should act, and this is really a lot harder than you would think. But then this feels like a weird criticism to give, considering that I also like intrigue and trying to keep track of other characters' manipulations. There is certainly plenty of that, albeit in a more subdued and bureaucratic manner than I'm used to. On top of that, the writing itself is very competent and I like Smiley as a protagonist. I suppose that it might just be the type of book that Tinker Tailor Soldier Spy is. There is little in the book that is big or flashy, blatantly favouring the understated and subtle instead; even when there are recollections of being shot, it's told in a very subdued manner. So it seems fitting somehow that my feelings are similarly subdued. It's not a book that you gush about, but one that you go to for quiet reflection and a slow burning read. Perhaps a little anti-climactic, but then it never promised a flashy finale.